Any idea what the County has planned for this building and the one across Main Street? Will all the functions in both buildings move to the new facility? 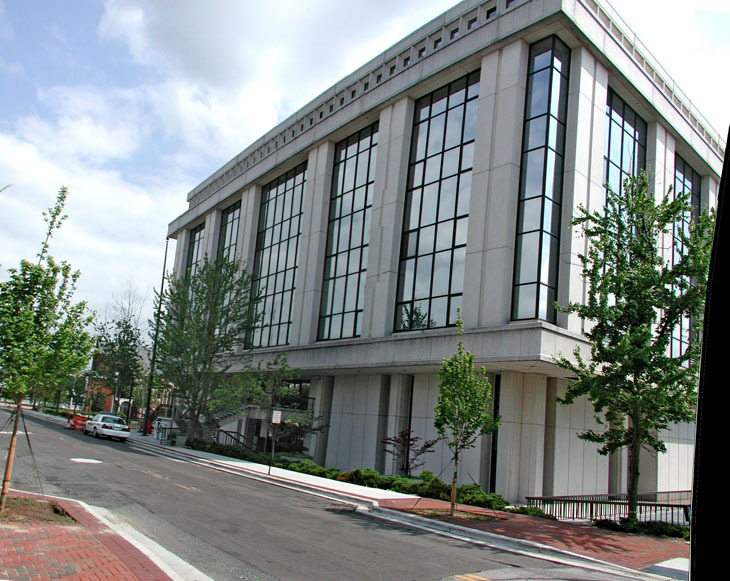 The county's 1978-2012 courthouse was outdated and hated from the moment it was completed. Worse yet, the powers-that-be destroyed an entire block of attractive - some beautiful - structures in order to build this cold mess. The best of the lot was the Hotel Malbourne, on the northwest corner of N. Roxboro and East Main. 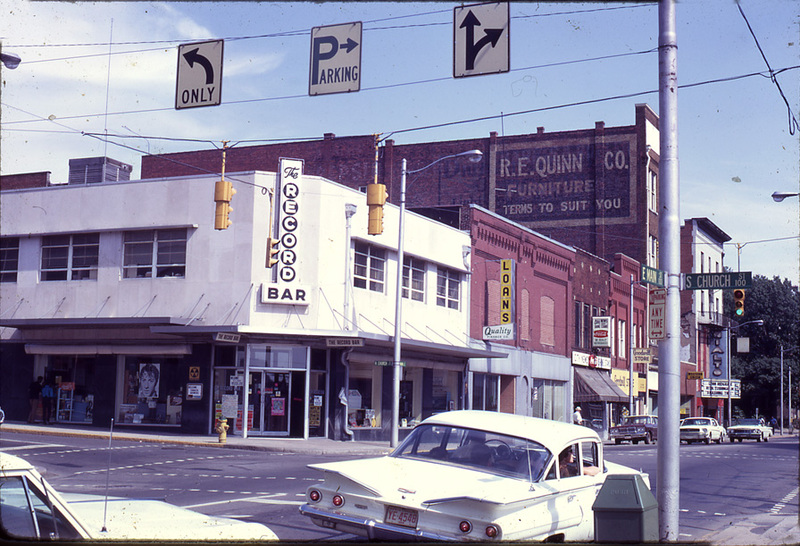 Using urban renewal funds, the city demolished the entire block bounded by Church, Parrish, Roxboro, and East Main streets, including the Hotel Malbourne. 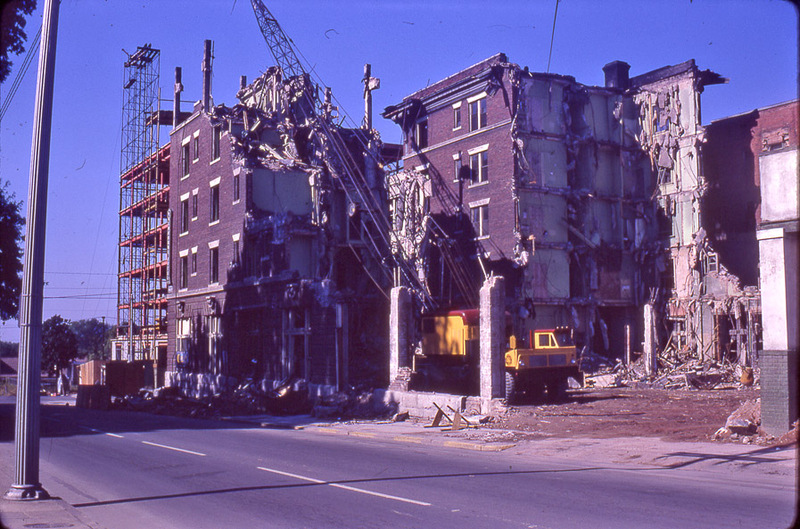 These structures were taken by the city and demolished using urban renewal funds, along with the remainder of the block. To some extent, this entire block fell victim to the pipe dreams of an Oklahoma developer named - Barket, and the anxiousness of a city to do whatever it could to a attract a developer who promised a 40 story building to be constructed in downtown Durham on the block between E. Main, Church, N. Roxboro, and E. Parrish Sts. The on-again-off-again flirtation between the city and Mr. Barket persisted throughout the later half of the 1960s, until he finally pulled out, never to be heard from again. In 1978, the city built a new courthouse on the block, which looms, Death-Star-like, over the street. It seems that they tried their best to emulate Barket's Folly, but could only afford the first ~5 stories. 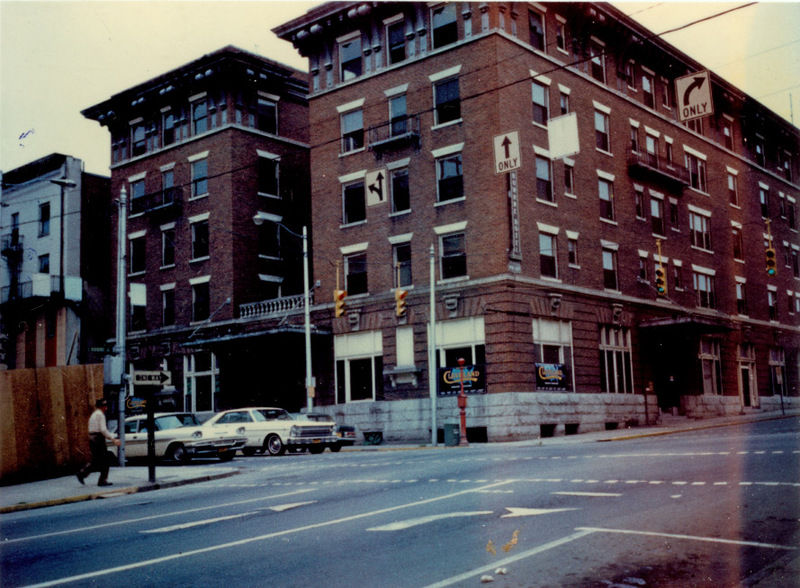 Where the block once was, 1975. 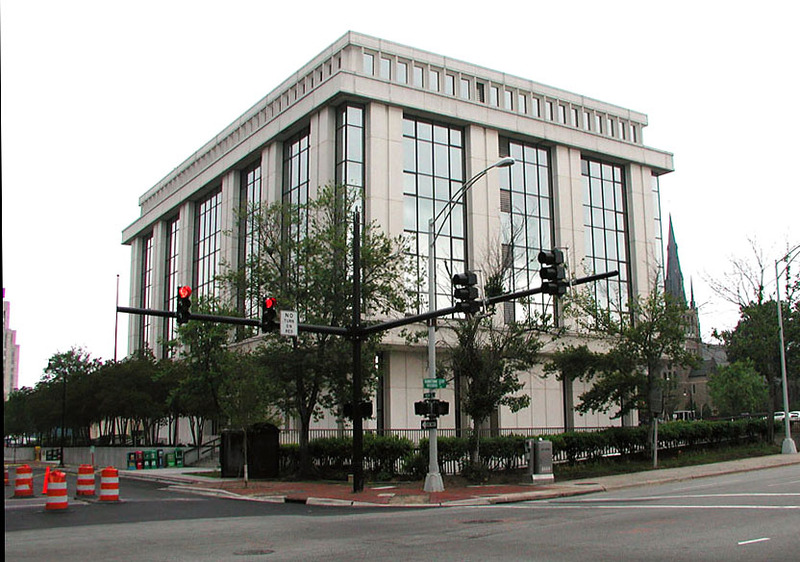 The county decided to build its new courthouse on the spot by the 1970s, designed by Archie Royal Davis. 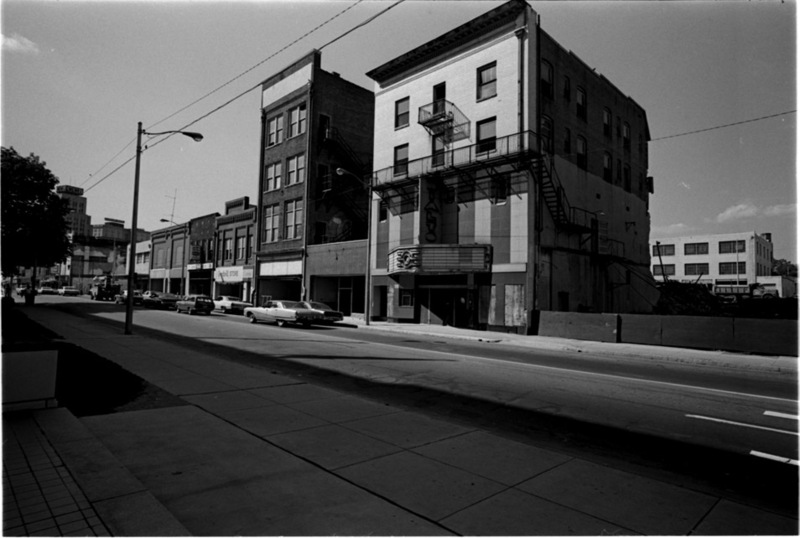 Looking southwest from Roxboro and Parrish, 1978. This remains the 'new' courthouse, until another new courthouse gets built at Dillard and Mangum. Looking northwest at the former Hotel Malbourne site, 2007. I'm convinced that it flies back to the swamp to house the Legion of Doom at night. I don't know whether the design direction was "try to intimidate people into avoiding the courtroom," but that's the vibe it gives me. It's among my least favorite buildings in Durham. By comparing the early pictures of the Malbourne to the courthouse, you can see how badly this building relates to the street - it's a fortress. Unfortunately, too many architects haven't advanced beyond this motif, still building long stretches of blank wall on the street, setbacks, etc., and we're building them again in our new structures. What's sad about the persistence of these design mistakes is that the examples of what worked as a part of the streetscape - like the Hotel Malbourne - are there. A little bit of Malbourne in our Human Services Complex, transit station, and 'new new' courthouse would be a plus, but it ain't gonna happen. It ain't any better from the back. Looking southeast from Church and East Parrish, 2007. In 2016, Durham County began renovating the third courthouse to turn it into an office building. The intended aesthetic is typical for O'Brien Atkins.